Mardi Gras is one of the most exciting events of the year, and, as such, you can participate in a variety of activities to commemorate the occasion. The date for Mardi Gras, which means Fat Tuesday, changes every year, but it is always 46 days before Easter. It is a time for rejoicing because it is the day before Lent begins—the weeks leading up to Easter that traditionally are spent fasting or giving up luxuries. Mardi Gras is associated with parades, parties, beads, and masks. There are also three colors associated with Mardi Gras: purple (symbolizes justice), green (symbolizes faith), and gold (symbolizes power). Using this color theme, you can make your own beads, masks and the like rather than relying on store-bought merchandise. If you're hosting a Mardi Gras party, consider making your own decorations and party favors for the event. Even if you're not having people over, you can make these crafts with your children just for the fun of it. If you have elementary school children at home, they'll enjoy making a purple, gold, and green collage. 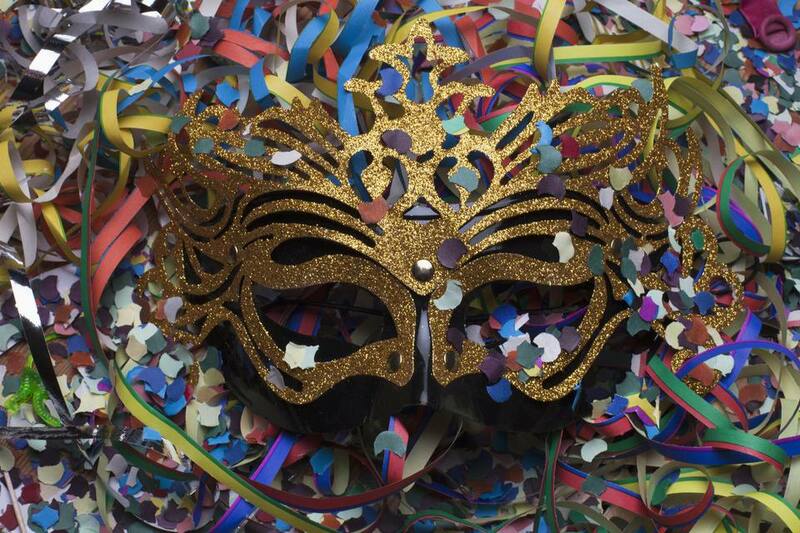 Even older children will get a kick out of making a miniature Mardi Gras float, a mask, foam crown or jester hat. Cheap Mardi Gras beads are everywhere on Fat Tuesday, but it's fun to make homemade beads for necklaces and other jewelry crafts. Homemade Mardi Gras party poppers make a nice tabletop decoration and gift. Cut small circles out of paper or lightweight cardboard. Paint them gold and make a handful of Doubloons (gold coins). If you will be going to a Mardi Gras parade, make a treasure sack to put all your goodies in. Celebrate with an easy-to-make Mardi Gras noise maker or other musical crafts. Make greeting cards using Mardi Gras clip art. String up purple, green and gold Christmas tree lights. Make your own confetti by using a paper punch on construction paper. You can even buy paper punches in fancy shapes at craft stores. Make a festive pinata for a fun decoration or as a party game. Recreate a parade at home and decorate your house or your yard with purple, gold, and green streamers. You and your guests can also have some fun in the kitchen on Mardi Gras. Make traditional Fat Tuesday or Creole cuisines like a king cake or Louisiana jambalaya. Prepare a dish such as spicy seafood gumbo that will take several hours to make but will allow you to spend quality time with your guests. Red beans and rice will serve as a nice side and try pralines as a sweet option. Hurricanes are the obvious cocktail of choice.